Yesterday I listened to callers on a local radio talk show discuss whether or not suicide was an unpardonable sin (whether or not a person can commit suicide and still go to heaven). It’s always interesting to me how a subject like this can spark heated discussion among people who ordinarily wouldn’t discuss spiritual things. It’s also interesting to discover how diverse the range of opinions is on the subject. 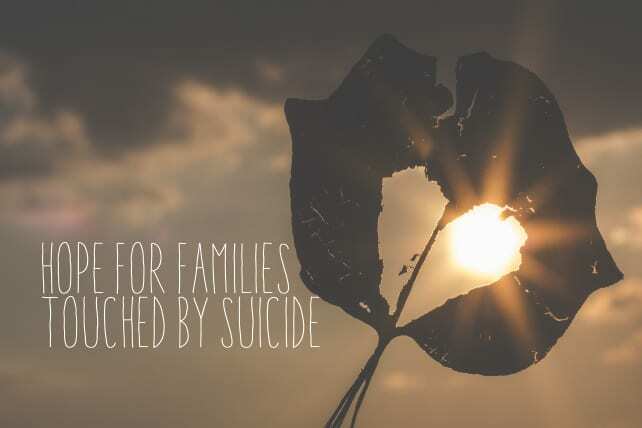 The discussion left me feeling sad for families who have been touched by suicide. I can only imagine (as displayed by the call-in discussion) how many unresolved questions must linger in their minds. 1) The test of eternal life is not whether or not a person takes their life, but whether or not they have received Christ’s life. No person will enter Heaven because of a good life or great deeds. Rather, eternal life comes by grace through faith in Jesus (Eph. 2:8-9). 2) The issue of suicide is serious because it deals with the sanctity of life (Genesis 1:26). Life is a precious gift of God created for a worship-purpose. 3) At the same time, ALL SIN is a serious offense to a holy God—no sin can be taken lightly (Psalm 51:4). 4) Yet, there is NO SIN that is more powerful than Christ’s atonement (I Cor. 15:57). Having said all of that, I think the issue comes down to two more items. First, the issue of confession: If a person has taken their life, and cannot confess their sin, how can they be forgiven? Interestingly, you only hear this question when it comes to suicide. You never hear someone say, “John told a lie right before he died, so I’m worried he’s not going to heaven.” The fact of the matter is that if a person is IN CHRIST, his salvation is not dependent upon continuing to confess each sin after his conversion. That would make salvation dependent upon something other than Christ alone. Confession is, however, important for the person’s fellowship with God—but it doesn’t change the person’s standing before God—which leads to the second issue: Righteousness. When a person comes to Christ, not only are their sins forgiven, but also they simultaneously receive the righteousness of Christ (Romans 5:18). When we think of salvation as merely the forgiveness of sin, it can give us the false impression that a “clean slate” is what gets us into Heaven—as if Christ did us a great favor and now its up to us to “keep it up.” But that totally defeats the biblical concept of grace. But when we couple the idea of forgiveness with the truth of righteousness, it is difficult to fall into that false assumption. Jesus said, “For I tell you, unless your righteousness exceeds that of the scribes and Pharisees, you will never enter the kingdom of heaven” (Matthew 5:20). That truth ought to shock us—after all, the Pharisees and scribes kept the letter of the law! But even their grandest efforts didn’t please God. The good news is that in salvation, Christ not only forgives our sin, but He gives us His righteousness! It is Christ’s righteousness that makes us pleasing to God—without which we cannot enter heaven. Christ’s righteousness is a gift that we didn’t earn. And if we never did anything to deserve it in the first place, we certainly can’t do anything to lose it. Instead, it is a covering over our sin that allows God to see us the way He sees His Son—even when we commit sin—including suicide. After serving in campus ministry at the University of Central Arkansas and coordinating student conferences for the Department of Church Ministries from 2000-2005, Scott pastored Wyatt Baptist Church in El Dorado Arkansas. In 2008, Scott’s wife, Jill, passed away in an automobile accident. He recalls, “God used our Church to be Christ to my family and me during that time.” After seven years of pastoring, Scott was selected as the Executive Director of DiscipleGuide Church Reources, a department of the Baptist Missionary Association of America. Scott’s most important ministry is to his son, Bryce.